Last week Ginger Kathrens, the photographer who's followed the stallion Cloud since the day of his birth, filed a lawsuit to stop BLM from gathering wild horses from the territory Cloud roams. Ginger was backed by many humane organizations and there's been a legal delay while a judge considers the facts in the case. What happens next could effect not only the mustangs of the Pryor Mountains, but wild horses throughout the West. Want a virtual trip to Shackleford Banks, home of wonderful wild horses? Check this out: A trip with Sue, the equine ranger! 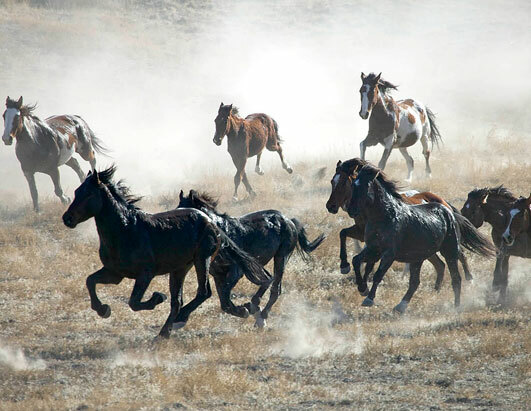 LOVELL, WY- August 28, 2009: In response to the destructive removal planned for America’s most famous wild horse herd, the Cloud Foundation and Front Range Equine Rescue have filed a lawsuit and a request for an injunction in Federal Court in Washington, DC. This would be the largest removal in the 32-year history of this specially designated wild horse range. The helicopter drive-trapping operation would be shrouded in a cloak of secrecy as BLM proposes to close the entire public lands area to humane observers and the general public except “on a case by case basis”. BLM is circumventing Congress’ wishes that wild horses be protected in the American West. The House just passed the Restore Our American Mustangs (ROAM) act and the Senate will review this bill (now S.1579) when they return from recess in September. “Is BLM just trying to do as much irrevocable damage to America's wild horses as fast as they can before the Senate can act?” asks Ginger Kathrens, Volunteer Executive Director of the Cloud Foundation. “Right now there are twelve entire herds being eliminated from 1.4 million acres in Eastern Nevada because these lands are suddenly not appropriate for wild horses,” Kathrens continues. “However, no action has been made to reduce cattle grazing in these areas.” There are no grazing permits in the Pryor Mountain Wild Horse Range and reasons for holding an unprecedented removal this year are not clear. The range and adjacent lands are in excellent condition following three years of drought-breaking precipitation. BLM will take older horses who could be sold directly to killer buyers or destroyed on the spot according to their codes of federal regulation. Lakota and Northern Cheyenne Tribal Leaders will gather in response to the BLM’s destructive actions on Saturday, August 29th. This ride “Honoring Freedom: The Ride to Save America’s Wild Horses” will start in the lowlands and culminate in ceremonies at the Dryhead Overlook atop the mountain. Remember my post about the National Wild Horse Adoption Day contest? I just wanted to say a HUGE thank you for posting about the National Wild Horse Adoption Day contest on Wabi Sabi West. Thanks to you, I'm a finalist, in the top ten with my entry of "Yuga"! I love mustangs, and I ride one every week or so, so I jumped at the chance to name the National Wild Horse Adoption Day mascot. The question was then, "What would be the perfect name?" The first thing that came to my mind was my little sister. We recently adopted her from India, and it's like we have always been family. What was even better was the fact that her name was "Yuga" which means "forever" or "ages" in Sanskrit. It didn't take me long to put everything together in an essay that was close to me in many ways. The winner hasn't been chosen yet, and even if I don't win I'll feel like a winner. I mean, I got to honor my amazing little sister and a legacy of free spirits! What could be better than that? Again, thank you so much for posting about the competition on your blog. Without you, I would not have known about it! If you live in the San Francisco Bay area, especially near Davis or Sacramento, California, I'm doing two booksignings this weekend and I would LOVE to meet any writers, horse/book lovers. If you live too far away, you can pass my invitation to anyone you know who DOES live out that way. My presentations will be casual, sitting on the floor, sharing horse stories, and I totally encourage kids to bring along their own horses -- plush, plastic, but probably not live, unless they're miniatures. And, for those of you who live way too far away to come visit, here's an unpublished ('cause he was pretty dirty from rolling!) photo of the Phantom to keep you company! Please join us as children’s author Terri Farley reads from her kid’s series, The Phantom Stallion. She will be reading from and talking about this loved series as well as participating in children’s activities, including drawing, games, and prizes. Once upon a dream, a magical silver mustang leapt from the pages of the Phantom Stallion books to gallop the Nevada sagebrush. 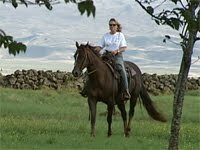 See and hear Terri Farley and the real Phantom Stallion as they tell the story of how dreams really do come true. I'm excited that a national TV network is airing a film about the positive impact of mustangs. Keep your fingers crossed that images of these horses will touch human hearts and even more people will stand up to save wild horses. You'll have to check your local TV listings to be sure, but ABC Primetime will be on tonight at 10 pm at my house. That's a little late for me, but I'll be watching! I just found this snippet from Hawaii's Horse Expo (hope I can go next year!) and thought you'd like to watch -- not just for the horses, but for the scenery. Look at those rolling hills and the sky that dominates everything beneath it! Yesterday was my first chance to see mustangs ridden by the inmates who trained them and it was amazing. In the noisy, unfamiliar arena, the horses were great -- moving through all gaits, displaying great stops,side-passes, flexing and can be handled all over without batting an eye. Several of them came to the rail to be petted and were very interested in meeting new people. All of this, only four months from the time they thought all of us were predators, only interested in eating them! Hank Curry, the trainer of the inmate trainers, is a wonder-worker. If I'd been able to pick one, it would probably be Midas. He's a little red dun who looks like a golden chestnut until you spot his dorsal and leg stripes. He's just over 13 hands, and what he's missing in height (so far), he makes up with conformation and attitude! Besides that, your arms wouldn't strain to sling on the saddle. I probably would take Lobo, too, or Cinder,and Two-Tone was pretty and friendly...in short, I could feel every one of them galloping around my heart. Each horse found a new home yesterday. From now on, I'll be recommending that people who aren't experienced trainers adopt through the prisons. A televised re-enactment of wild horse shootings in Alberta has prompted tips from the public on the crimes, according to the Royal Canadian Mounted Police (RCMP). "We're following up on some tips we've received," said Cpl. Tina Millard of the Sundre RCMP. Crime Stoppers produced the film in response to the shooting of three more horses, including a pregnant mare, whose bodies were found last April near Sundre, Alberta. In the past eight years, 29 wild horses have been found shot dead in the area. "We take these shootings seriously, but because they happen in remote areas, when we find out about it, it's usually weeks later, so that does hinder our investigations," Millard said. A wild yearling shot near Sundre, Alberta. While no arrests have been made, there is speculation that the same person or group of people is responsible. "We think it's probably the same individual. Twenty one of the 29 shootings have all been located within a few kilometers of each other," said Doreen Henderson of the Wild Horses of Alberta Society (WHOAS). The group works to protect the horses and argues that their numbers are dwindling. The Alberta government issues licenses allowing for the capture and removal of the animals from the area as population control. The WHOAS is offering a $25,000 reward for tips leading to an arrest in the case, while the Humane Society of Canada is offering a $1,000 reward. The money offered by the WHOAS comes from corporate and individual donations, according to Henderson, who said the WHOAS had originally offered $10,000, but has since received some large donations from the Alberta Equestrian Federation and other business donors. Anyone with information about the shootings can submit an anonymous tip via the Alberta Crime Stoppers Web site, or contact the Sundre RCMP at 403/638-3675. I know most of you are too far away, but please if you, or anyone you know will be at the Wild Horse Expo tomorrow (at the Livestock Events Center, 1350 N Wells Ave, Reno) please come say HI! I'll be there 1-3, working with kids, signing books (bring-your-own, or buy one to benefit the horses) and hanging out! p.s. I plan to be there for the Prison Horse demo too. Can't wait!!! Call me morbid. In adult writing workshops,I sometimes ask people to write their own obituaries. And that makes me wonder what people will say about me after I'm dead. Will I be called kind? Will they say I wrote good books and valued the right things? Or is there something else huge between now and then that will overshadow all of those? I can tell you this: any kindness or care for the weak that I've shown is absolutely D W A R F E D by Shirley Allen. A few weeks ago I told you about a petition aimed at stopping Nevada's Department of Agriculture (NDA) Director Tony Lesperance from ordering the deaths of orphan mustangs. The state veterinarian threatened Shirley directly, saying the orphan foal Rio could be seized and killed. Shirley may have gentle hands, but she has a cowgirl's backbone. She not only stood up for the wild foals, she taped the threats and that's why they're on YouTube! On August 7, a bunch of wild horses and their people gave students a wild West class in what it means to be a mustang. I was asked to speak about my books and my friend Cindi spoke about her own wild horses and invited the students to the Wild Horse and Burro Expo. Of course every wild horse and the people who care for them are stars in my eyes, but I wanted to show you a sweet photo of Chilly Pepper, the miracle mustang who was rescued on her second, snowy day of life from beside her dead mother. 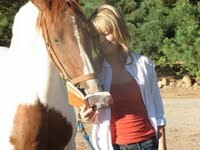 And here she is with Sam -- yep, you read right -- one of my long time readers. 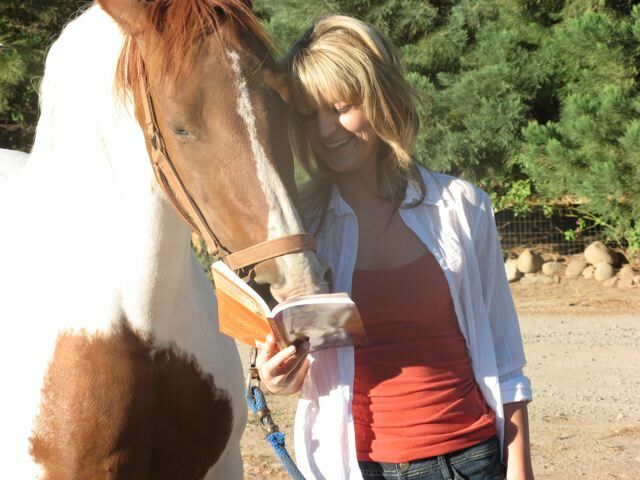 Sam is an intern at the Wild Horse Sanctuary in Shingletown, California and she and her sister both love wild horses! A heartfelt and angry question recently appeared on my YouTube site, where the real Phantom appears(If you haven't seen it, or want to see the majestic stallion again, you can click here : Phantom Live). I hope the writer -- and you -- understand my response. why can't the phantom﻿ be set out in the wild? why does he have to have the next best? other people might want to have at least a chance to see him and i'm sure he would prefer the wild. Thanks so much for your note and for caring about the Phantom. This was the problem: land developers built houses all over the Phantom's winter range. He'd been bringing his herd there for at least 10 years. Suddenly, there were green lawns to eat and water ran down gutters like swift, fresh streams. But the place was overrun with people. Mares were hit by cars. Foals were attacked by packs of pet dogs. The stallion must have been confused. Still, he believed it was his land (I agree) and he kept coming back until he was down to ONE mare and her baby. Although many of us who loved him wanted to keep him out on the land, we were afraid he would be the next one killed by human intruders, and moving him to 5,500 open acres seemed like a fair, if not perfect, solution. I don't belong to many online communities, but I've mentioned BARNMICE before and it's lots of fun. I just received the note below from them and thought some of you might be interested in working with virtual horses and their people, while honing your communication skills. With visitors from 176 countries, our community is growing fast! Can you please just leave a comment if you can see this message? If you can, I'll start working on posting photos again! I've missed you a lot, but I'm having some confusing computer problems! I did have a wonderful time with Miss Chilly Pepper and I'll be seeing her again tomorrow at the Wild Horse Sanctuary. It's totally beyond believable that I'll see the real Phantom tomorrow because there will be so many people there, but it will be fun just knowing he's near, and maybe I'll get to see Pride! I know lots of you enjoy chatting with other fans of books and horses and some are interested in the reader campaign for a special edition to the PHANTOM STALLION series, too. Take a look, print it out and come visit us! I think you'll have fun with this! Write or Die is a web application that encourages writing by punishing the tendency to avoid writing. Start typing in the box. As long as you keep typing, you're fine, but once you stop typing, you have a grace period of a certain number of seconds and then there are consequences. Can't think of anything to write? Start with your senses and describe how a horse (or your cat or little brother...) looks, smells, feels, etc! It always works for me. You have just a couple more weeks to enter the Girls Horse Club Fiction contest. I'm one of the judges and it's really exciting. AND the prizes keep streaming in! Ask Pegasus to be your muse OR wait until tomorrow for a fun way to trick yourself into writingwritingwriting! Can you find your horse ? Some folks are skeptical when I write PHANTOM STALLION and WILD HORSE ISLAND plots involving stolen or lost horses. Sadly, this is not as unusual as we'd like to believe. That's one reason many horse owners oppose horse slaughter; horses are sometimes stolen so that thieves can make "a fast buck." NET POSSE and familiarize yourself with missing horses in your area. DENVER -- A federal judge in Washington has blocked the Bureau of Land Management's plan to use helicopters and baits to trap and remove 100 wild horses from 128,000 acres of federal and private land near Rangely in northwestern Colorado. U.S. District Judge Rosemary Collyer ruled Wednesday that the BLM overstepped its authority because it had not determined whether removing the horses was necessary to preserve the ecological balance and multiple use of that area. Europe and Canada are reconsidering consumption of U.S. horse meat because of the drugs pumped into performance horses. Humans can be harmed by many "treatments" including iodine-peanut oil injections along the spine, anabolic steroids, cocaine, amphetamines, opioids and even snake venom given to horses so proposed new rules will mean that horses coming from the US will have to be kept drug free on a feedlot for half a year. And that makes them more expensive. Not the motive I'd hoped for, but hey, I'll take it! Do you remember the sea lion pup nicknamed Fruitvale? He somehow made his way to the busy 880 freeway in Oakland, California during morning rush hour traffic,and was discovered near the Fruitvale exit on the freeway. Taken to the Marine Mammal Rescue Center, he was mildly malnourished, but was revived at the Center. Now he's been released back to the ocean at the Farallon Islands. Farallon means "rocks jutting from the sea," but I can't helping thinking it sounds like far and alone. It's not SO far from where I live and I'd love to visit. Have any of you seen a pretty representation of a selkie -- male preferred & not too revealing? I'd love to be able to share such an image with readers who've read SEVEN TEARS INTO THE SEA and want to view an artist's image of this Celtic shapeshifter, but I'm not having very good luck! If you've never been to Hawaii, you'll be surprised at what a strong island culture it's been able to maintain, even though it's part of the U.S. with all its malls and fast food. In fact, to my mind, Hawaii has the best of everything. Can you tell I'm longing for a return trip? LANAI CITY - Royalene "Mamo" Fernandez will take over as Lanai island manager for the new Festivals of Aloha, Maui Nui Style. Fernandez is known for her lei-making skills and is a longtime Lanai paniolo, or cowgirl. I'm excited that I'll be at the Wild Horse and Burro Expo this month along with some wonderful prison-gentled mustangs. I think this is a triple winning program because captive horses have a chance to DO something. Since their freedom has been taken, at least they're not stuck in a pasture for the rest of their lives. They've trained and go to homes that appreciate them. Captive prisoners have a chance to learn new skills which require judgement and patience. And of course the adopters win big time! If you go to this page Prison Ponies , scan down and you'll be able to "window shop" for your own gentled mustang. Besides some really nice photos, you'll also be able to read the trainer's notes and comments from my friend Cindy. She has several prison trained mustangs of her own, including Little One, the beautiful paint at the very bottom of the page! p.s. isn't this mustang a beautiful color?